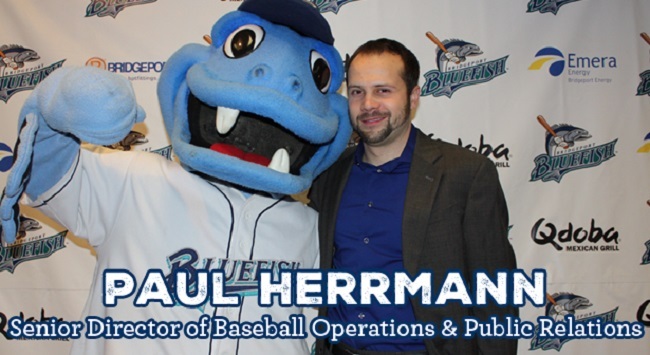 The Bridgeport Bluefish today announced that Bluefish employee Paul Herrmann, formerly the Director of Public Relations and Baseball Operations, has been promoted to Senior Director of Baseball Operations and Public Relations. He also handles the team’s marketing strategy, among other various roles in the office. Paul joined the Bridgeport Bluefish front office in November of 2008, when he was hired as a Media Relations Coordinator. 2016 will be his eighth season working with the ‘Fish. “Paul is an experienced leader within the Bluefish organization and is extremely deserving of this promotion,” says Bluefish General Manager Jamie Toole. Prior to joining the Bluefish, Herrmann functioned as the Media Relations Assistant for the Long Island Ducks where he actively worked with local media, while also writing press releases and maintaining team statistics. Paul has also spent time working with the New York Jets, New York Knicks and Sussex Skyhawks. Herrmann graduated from Rutgers University in 2007 and spent two years in the Athletic Communications department during his time there. The Bridgeport Bluefish are members of the Atlantic League of Professional Baseball and play their home games at The Ballpark at Harbor Yard. For further information, call 203-210-BLUE (2583) or visit BridgeportBluefish.com.